It was not without some trepidation that I chose to watch this film this past Sunday. You may remember that I wrote about Robin Williams' death in a previous post, and I had not watched a performance of his since his passing. Williams plays the curmudgeonly Henry Altman, a man so angry he is putting his life in danger. When he is kept waiting at the doctors, only to find that he has a brain aneurysm and is being seen by Dr Gill (Mila Kunis) instead of his regular doctor, he demands to know how long he has left to live. Stressed out, drugged up, and suffering from emotional fatigue, Dr Gill replies to his demands by saying he has only 90 minutes. 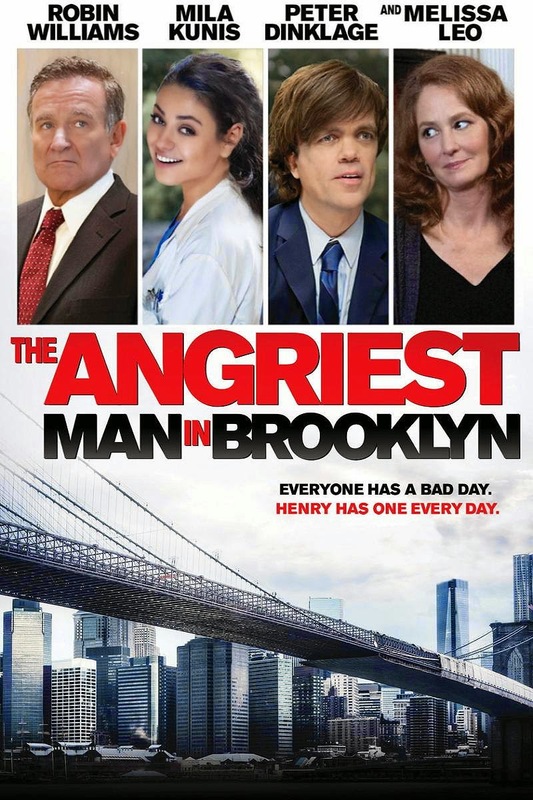 Leaving the hospital in a fit of rage, Henry becomes convinced that he truly has only 90 minutes to put right the many grievances and regrets he has in his life. My main problem with the film is that I wasn't quite sure whether it should be billed as a comedy in the way the trailer suggests. While Williams' exaggerated angry man persona is amusing in its own way, it is revealed that his crabbiness stems from a deep unresolved grief at the death of his son. As a result the film seemed not to quite know what it was trying to do. While I don't think the script is anything to write home about - I was particularly unsure of whether I liked the first person narrative sections from Henry and Dr Gill - there were moments in this film which shone brightly. Kunis and Williams both brought depth and sincerity to characters who were deliberately quite cartoonish. One of the most powerful moments in the film occurs when Henry is recording what he believes will be a last message to his estranged son; he speaks of the small and selfish love he has for his child, before dissolving into a bout of intense rage at the hand he has been dealt in life. The film is not without flaws, but he brings his characteristic energy and passion to the role. The Angriest Man in Brooklyn is not a great film and the premise is quite ludicrous in its way. That said, there is a bizarre poignancy that comes from watching it after Williams' untimely death. The overall message seems to be not to wait until it's too late to resolve those conflicts and regrets that plague us, and that is not such a bad moral.